The pairs’ clubs have been drawn together in the Dublin Senior Football Championship. 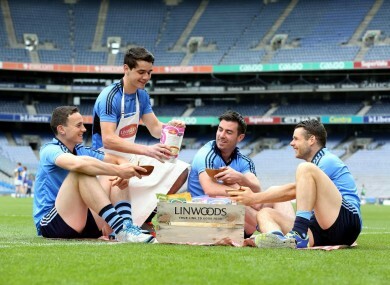 Michael Darragh MacAuley was speaking at the announcement of Linwoods as the official health food supplier to Dublin GAA. IT’S AN UNLIKEY midfield battle – the reigning Footballer of the Year against a two-time European Indoor 400m gold medallist – but it could happen after Michael Darragh MacAuley’s Ballyboden St. Enda’s club were paired with Ballinteer St. John’s – the home parish of David Gillick - in the next round of the Dublin Senior Football Championship. MacAuley, of course, is no stranger to athletics himself having completed the 10km Samsung Night Run just hours after securing the National Football League Division One title with Dublin back in April. However, this is quite a different test and after Gillick recently spoke about the prospect of marking the two-time All-Star on Second Captains, MacCauley admitted he might have to change his training regime to cope with the demands of coming up against the speedster. “It won’t be on for a while but it’s an interesting one. One aspect of Gillick’s game MacAuley probably won’t lose too much sleep over is the Ballinteer man’s shooting. Indeed, the former athlete recently admitted to TheScore.ie he was more defensive in his mindset. And, as this video shows, there’s probably a good reason for that. Email “MDMA feels the need for speed as he looks forward to marking David Gillick”. Feedback on “MDMA feels the need for speed as he looks forward to marking David Gillick”.